I’ve been tutoring the GMAT for over five years now, and I thought it was time that I retook the test. 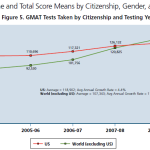 Previously, I took the GMAT once in 2006 and I had very little memory of the test center, so when students asked me about the test day experience, I wasn’t able to give an authoritative answer. My score in 2006 was a 710, which I used when I applied to UCLA Anderson (I was accepted and graduated in 2009). My goal this time was to score in the 99th percentile, which requires a 760 score. My study plan was as follows. First, I bought the new Official Guide 2016 and did every single question in both the Quant and Verbal sections. I was familiar with most of the questions already since I’ve been reviewing them with students for many years. However, I still missed some of the harder questions, and I spent considerable time reviewing them. Next, I took 3 practice exams, all from the GMATPrep software. My scores on the three exams were 780, 760, and 770. However, I already knew many of the questions from each test, probably between 5-10 in each section. So these weren’t really fair representations of my score. I noted a few interesting things on the practice exam when I scored a 780 (it was the GMATPrep Exam Pack, exam #2). On this test, I scored a Q50/V51. On the verbal section, I got lucky and answered every single question correct. I think that’s the only way to get a V51. Although, I should point out that software actually asked the exact same question twice in the verbal section. Fortunately, I got that question right both times. While taking practice exams, I didn’t spend much time on Integrated Reasoning, and I only made one attempt at the Analytical Writing section. I figured there wasn’t much point since the practice essay wouldn’t be graded anyway. I noted that on all three GMATPrep practice exams, I was asked many of the same questions in the Integrated Reasoning section. The software must have a limited pool of IR questions. Skipping over AWA and IR during my practice tests proved to be a mistake on exam day. My exam was scheduled at 8AM at a test center in LA. They wound up taking me a few minutes early. Before the exam, you had to provide ID and do a palm scan, then put all your stuff in a locker. To leave the room during breaks, you have to raise your hand and the administrator comes and escorts you out, then scans your palm again. I began with the essay and thought it went well, but as IR began, I was feeling a bit of fatigue, even though it was early in the morning. I think at this point it had been about 2 hours since I ate breakfast, and I was experiencing a sugar crash. As a result, I did poorly on IR and only scored a 4 (I had scored a 7 or 8 in IR on all the practice tests.) I have to admit that’s a pretty bad IR score. Between IR and Quant, I took a break and downed half a Red Bull. I tried to use the full break to give the Red Bull time to kick in. I started out pretty strong in Quant; the questions felt pretty easy and I was solving them quickly. They were almost too easy for the first 10 questions, so I was starting to doubt myself, thinking I must have been getting questions wrong. However, I tried to remind myself of the advice I give students: never try to judge how you’re doing on the exam by the difficulty level of the questions you’re getting; just do your best to solve every problem while paying attention to the time. Somewhere around question 15 the questions began to get extremely difficult. 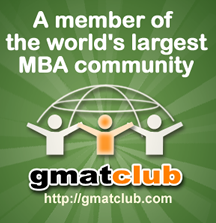 There was a geometry question that was unlike anything I’ve ever seen in the thousands of GMAT problems I’ve done. I got bogged down on the question and made the mistake of spending 4-5 minutes trying to solve it, then wound up making an educated guess. Instead of doing that, I should have just made a random guess after 1 minute. A few questions later there was another difficult question that I thought I could solve; I foolishly spent over 3 minutes on it. I wound up guessing again, but had lost a lot of time. As the clock wound down, I was very pressured for time. I don’t recall the exact numbers, but I think I had five minutes for the last eight questions, which is less than a minute per question. I had to switch into “instinct mode” for a couple data sufficiency problems and just use my experience to quickly get to an answer in 30 seconds. There’s a good chance that I got several questions wrong that I would have solved correctly if I had more time. My score was Q48; as I write below, I really needed a Q49 to get to my desired overall score. For years, I’ve been telling all of my students they should expect to guess on 2-3 questions in order to maintain an even pace and not get pressured at the end. Basically, I made the mistake of not following my own advice. Between Quant and Verbal, I drank the rest of the Red Bull. Verbal actually went pretty smoothly. I feel like I got every Reading Comp question correct, and nearly every Sentence Correction. There were several tricky Critical Reasoning questions that took me a few minutes to puzzle out. I finished Verbal with about 6 minutes to spare. My score of V45 means that I most likely answered 4 or 5 questions incorrect. My overall score with a Q48 and V45 was a 740, which is 97th percentile. From reading the forums, I think a single extra point on either Quant or Verbal would have bumped me up to a 760 (99th percentile). I’ve read posts where Q49/V45 or Q48/V46 gives a score of 760. So if I had managed my time better on Quant, or answered 1-2 more questions correctly on Verbal, I might have been able to get that extra point.